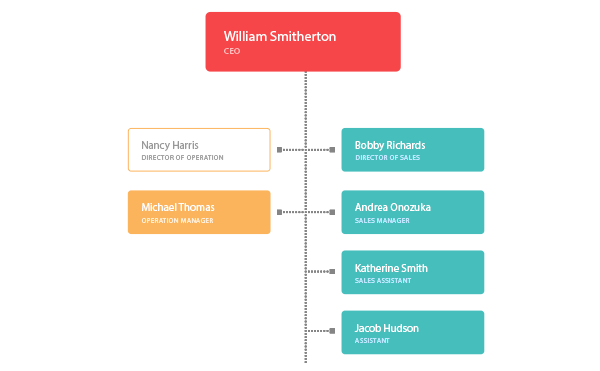 Organizational charts, also called organization charts or org charts, are diagrams that reveal the overall structure of the workforce of a company. Through an organizational chart, the formal indirect or direct relationships between the positions in a company are presented. The chart also shows how different departments are connected. Organizational charts are types of graphs that depict four types of relationships: line, lateral, staff, and functional. Line relationships exist between superiors and subordinates. Lateral relationships exist between different departments of similar rank. Staff relationships exist between a managerial assistant and a line manager. Functional relationships exist between a specialist and a line manager. An organizational chart is usually shaped like a pyramid, with the President or Chief Officer in the top rectangle and levels of subordinates in descending rectangles according to rank listed below. Each rectangle size corresponds to the level of authority. Thus, superiors have larger rectangles than subordinates. Peers have equally sized rectangles. Solid lines between rectangles signify a direct relationship, and dashed lines symbolize an indirect relationship. Arrows represent the direction of communication flow between the components of organizational charts. An organizational chart has its advantages. It promotes structure in an organization and defines the roles of the management. It also reveals the parts of a company that need improvement and possibly more or less employees. An organization chart also has disadvantages. It does not reveal anything about the managerial style. Moreover, organizational charts needs to be changed every time an employee leaves or joins the company.